The pōhutukawa and rātā forests which once turned coastlines and hillsides crimson are unlikely to be seen again. The reasons for this are many. The Australian brushtail possum tops the list (read more below). Possums eat the leaves, buds, flowers and young shoots of the trees and can kill a mature rātā within two years. In some areas they have contributed to the dieback of extensive areas of rātā. The discovery of myrtle rust is the most recent threat to pōhutukawa and rātā (see more below). The tiny seeds of pōhutukawa and rātā do not have enough food reserves to last long in soil, nor the strength to push a young sapling through the matted roots of grass, kikuyu and other weeds that invade areas where the trees might grow. 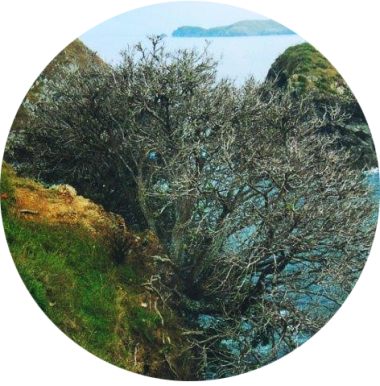 The tree’s roots, designed for spreading over the rocks, are also easily damaged, whether by farmers leaving trees unfenced in stock grazing paddocks or by people tramping over, or driving and parking on the roots. In New Zealand’s early history, rātā numbers declined alarmingly as potential rātā hosts were felled for timber, and forests cleared for farm buildings and stock. The historical use of fire in land clearing was fatal to pōhutukawa which are extremely sensitive even to low intensity fires – a light grass fire at its base can kill a mature pōhutukawa. People today are still removing trees to clear space for new buildings, improve views or during general landscaping alterations. Hybridisation between the two species threatens the survival of each individual species. For this reason Project Crimson strongly adheres to the rules of ecological sourcing of seed and trees. The first detection of the disease in mainland New Zealand was at a Northland nursery in early May 2017. Since that time it has spread throughout the North Island, and more recently to the South Island. There has been an enormous operational effort but the windborne nature of the disease means that containment has not proved possible. MPI have now moved from intense surveillance and the removal and destruction of host plants to one where they look to manage the disease over the long term. 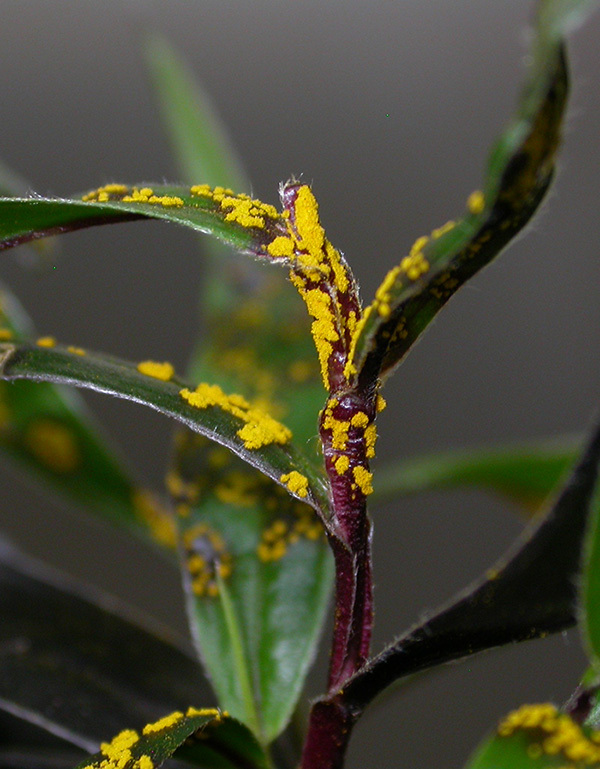 If you suspect myrtle rust, please take a photo and report to MPI (0800 80 99 66) and don’t move any plants, produce or gardening equipment offsite until you hear back from MPI. To secure the long term future of taonga Myrtaceae species, seed collection work is in progress involving manawhenua, to conserve the biodiversity of native Myrtaceae in New Zealand. As a result DOC is leading the collection of seed for seed banking. This includes pohutukawa. Click here to read our latest updates about myrtle rust. The Australian brush tailed possum was introduced into New Zealand in 1837 to establish a fur trade. Inits native land the possum is up against dingoes, bush fires and less palatable vegetation, but in New Zealand conditions are so favourable it often breeds twice in one year. It was estimated that the New Zealand possum population topped 70 million during the 1980’s and 90’s. Landcare Research now estimates that figure around 30 million, but the number has not been confirmed as the cost to do so would be better spent reducing possum numbers even further. These so-called cute furry marsupials ravage the bush — it has been estimated they chew up seven million tonnes of vegetation a year. Why are Possums a problem? Dairy and deer farmers have the added worry of possums spreading bovine tuberculosis. Possums are also a nuisance in suburban gardens, and sometimes even indoors. Project Crimson and its programmes, Trees That Count and TREEmendous, recognise that the use of 1080 for pest control is a controversial topic. However, along with the majority of conservation organisations, we support the leadership of the Department of Conservation and Predator Free New Zealand on this topic. This means that while 1080 is not without its drawbacks, we believe it is the best option New Zealand has right now in the fight against introduced predators. Predator Free New Zealand provides advice and equipment for trapping predators. Check out their website for more information.